Your feelings can get hurt so easily . . . an unreturned phone call, the disillusionment of unfulfilled anticipation, finding ways to avoid the pain of yet another disappointment. Yes, you can learn to deal with these often overwhelming feelings. Let's look at the forms rejection can take, where it comes from, and how to overcome the fear of it. Elayne Savage has gathered many wonderful stories over the years from colleagues, students, workshop participants and clients. She presents these sometimes poignant, sometimes humorous, but always profound and engaging vignette collages in her books and CDs. 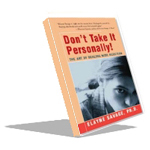 Don't Take It Personally! The Art of Dealing with Rejection (Book) - Wouldn't it be great to not be so sensitive to words, looks, or tones of voice? This thoughtful, good-humored book explores the many forms of rejection. You'll discover where it comes from, why you are sensitive, and how to overcome the fear of it. Most of all, you'll learn dependable tools for stepping back from these overwhelming feelings. You'll be able to choose how you want to respond. "Never before has the impact of rejection been explored to this degree. Don't Take It Personally! offers much reassurance and inspiration." — Susan Jeffers, Ph.D., author of Feel the Fear and Do It Anyway and End the Struggle and Dance with Life. 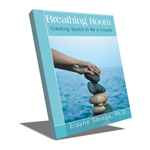 Breathing Room – Creating Space to Be a Couple (Book) You'll recognize what space struggles in relationships are really about. Expectations and disappointments, style differences, and hidden agendas lead to misunderstandings and hurt feelings. Before you know it, anger and resentment build up, taking up all the space. You'll learn how to make room for the respect and connection you hope for. This book is not just for couples. It provides valuable suggestions for anyone who yearns to become a couple but keeps bumping into those disconcerting 'space' issues. "In Breathing Room, Elayne Savage reminds us that intimacy requires both closeness and space. This book is a refreshing read for couples who seek to deepen their bond." Don't Take It Personally! 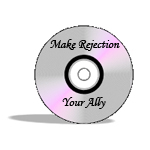 Make Rejection Your Ally (Audio CD) How are rejection and taking things personally connected? How do slights and taking things personally affect you professionally and personally? How can you check things out with the other person without sounding confrontational? How can you keep your expectations realistic so you don't get disappointed? You'll learn how to handle these tough situations with ease and grace. Caterina Rando interviews Elayne on this fascinating topic.